Forty days of mark-making, round three. Although in fact I am on day 43, because I have several pages left in the sketchbook and want to fill it. This time I have focused on ways of changing the surface. Rounds one and two were dominated by drawn marks - additive marks. 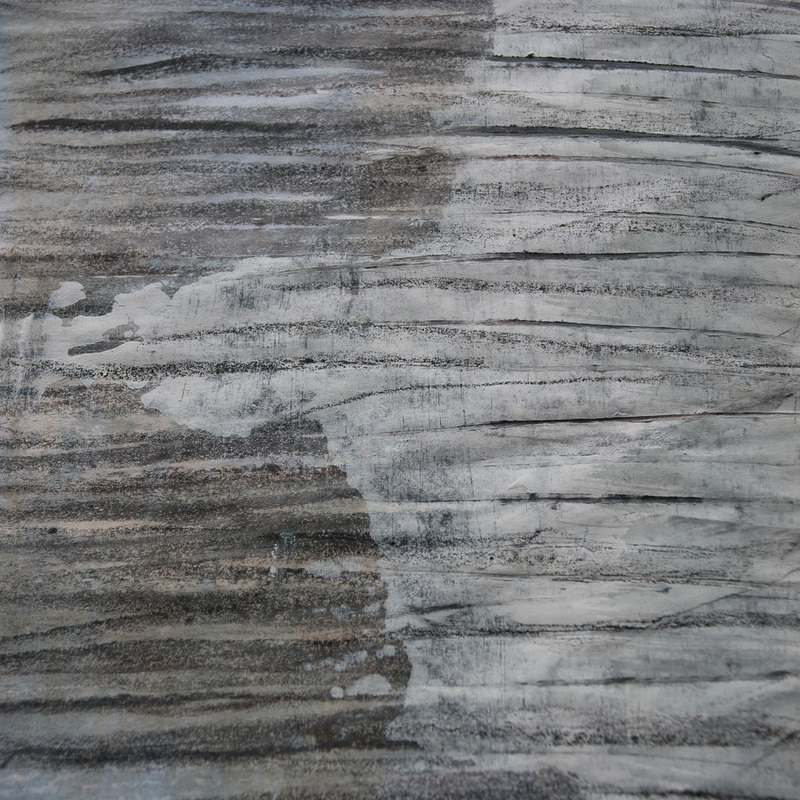 I wanted to make myself think about the surface itself more and experiment with subtractive marks and texture. 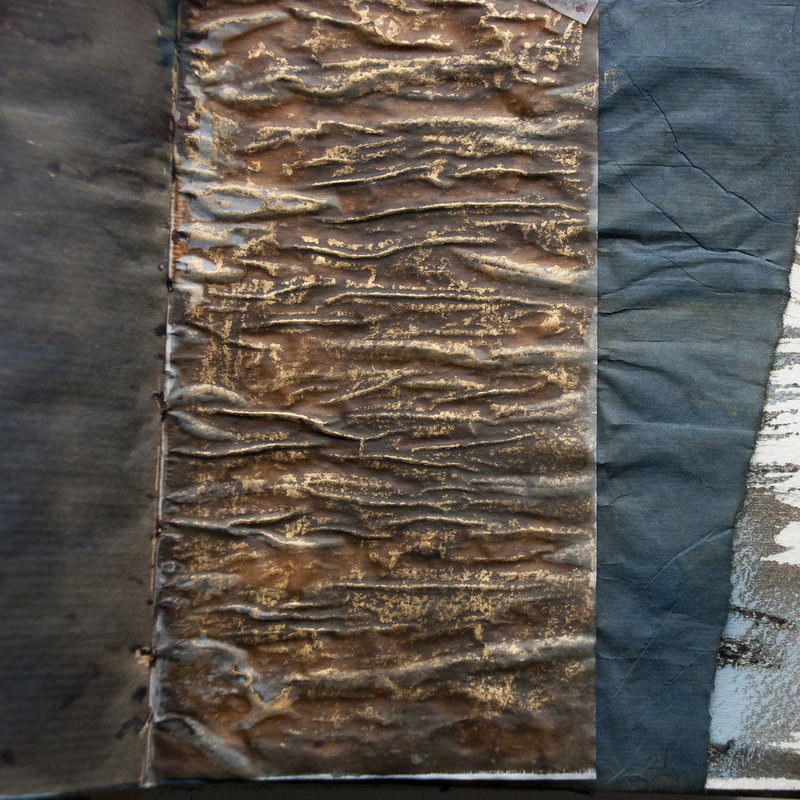 Scratching, creasing, rubbing, crumpling, piercing, sanding, combinations of different media ... any way of creating visual or actual texture. There have been some really bad pages - experiments that didn't work ... and couldn't be rescued. When I was tired sometimes all I could manage was a wash of ink over some wax crayon. But there have also been plenty of good or interesting pages. Some are impossible to photograph - all the camera can see is a plain, dark page, not the subtle texture or fragile marks. So the pages pictured here are just the ones that do photograph well. I got excited about the possibilities of gluing different kinds of paper to the surface and painting over it. 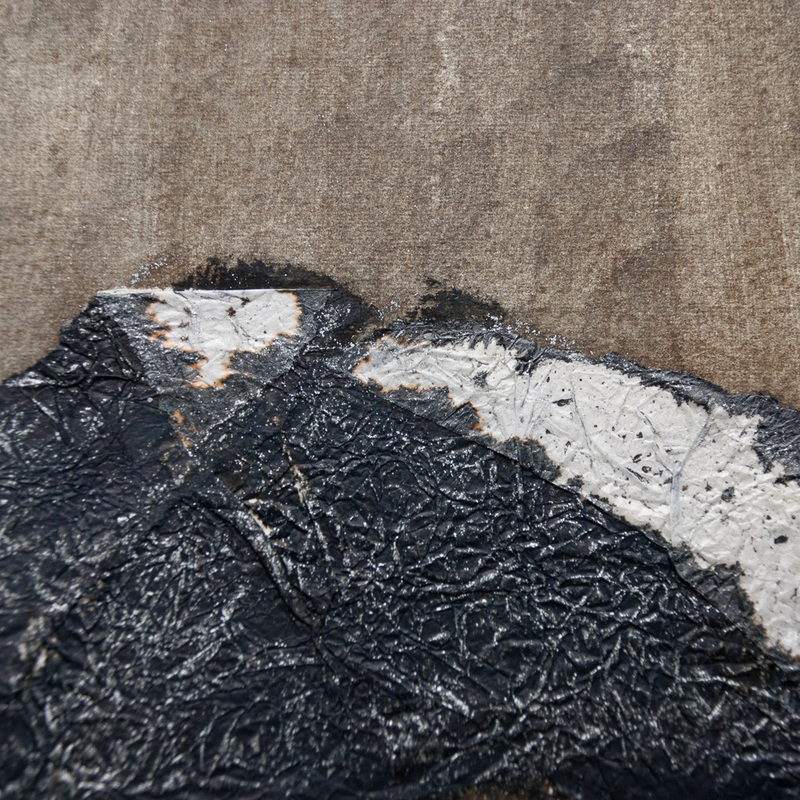 Different papers take the ink in different ways, just as different fibres react differently to dye. There were lots of ways to make interesting edges. I gathered up tissue papers, rice paper, pattern paper, packing paper, tracing paper, handmade papers, book pages and played around. 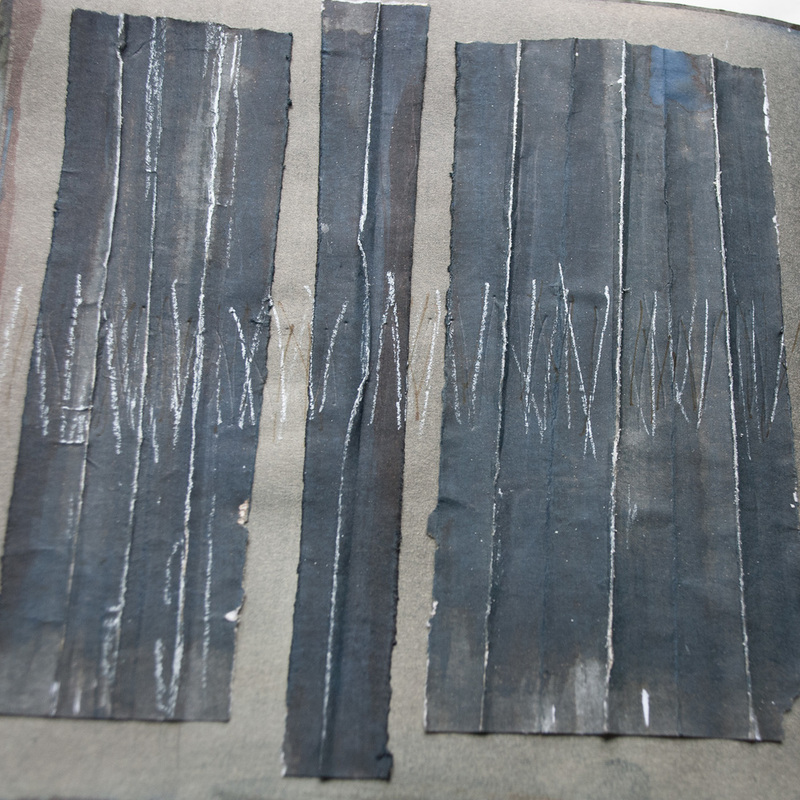 I also played with masking tape and double-sided tape, applying tissue paper or rubbing graphite or crayon over the top. The sketchbook is another handmade one with different kinds of paper in it. So every now and then I would turn the page to be faced with something challenging. Tracing paper. Or thin photocopy paper. I eventually learned to exploit their tendency to cockle and shrink when wet rather than fight it. But there were other types of paper I started to look forward to, such as a fine lokta paper that could be rubbed into holes when it was wet. Dealing with the restrictions of working in a book has been part of the practice. Although I think it will be interesting to repeat this with loose sheets of paper. That would increase the range of things I could try too. I also still like the restriction of forty days. It is useful to have a focus. Whenever I find myself reverting to my default marks, I bring myself back to the idea of changing the surface in some way. Although I consider this a mark-making practice, many pages are effectively drawings. I've wondered whether I should stop myself, concentrate more upon just making the marks. It is plain, looking back, that I have little interest in pattern making or repeating marks. In fact I am more often looking for ways to disrupt patterns or create interesting negative space. I also notice that I'm as interested in the surface and the impact this has on the look and feel of the marks. I think the important thing is to keep this exercise open and exploratory. Which means allowing myself to experiment with other design elements, if that is what draws my attention. 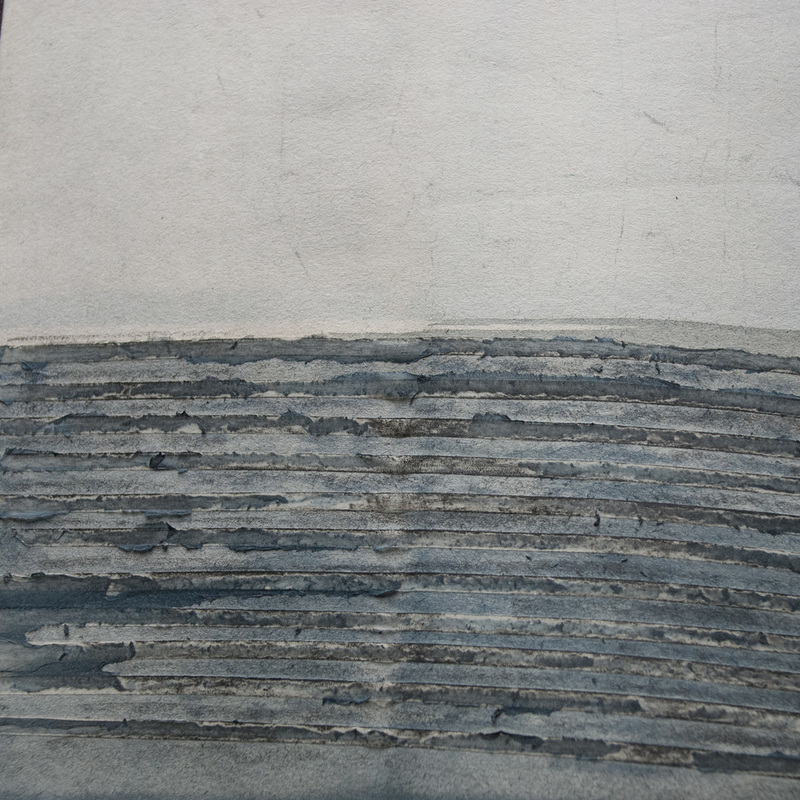 So immediately after I finished the first forty days of mark-making, I started a second. And since by the end of the first I was working almost exclusively with conté crayon, I decided to switch to ink - my favourite wet medium. I chose another home-made sketchbook - a larger one this time (8 inches square) but, like the first, filled with a mixture of different types of paper. Same principle as before - a minimum of one page a day, any mark. And so I began again. Then ... frustration! Nothing I did seemed to work out. After becoming really comfortable with the conté crayon all I seemed to get now were ugly, splodgy marks and puddles of ink on the page. And there was another problem. I had to wait for the ink to dry before I could turn the page! So not only did I not like what was happening but I couldn't move on and try something else straightaway. One of my favourite studio rules is that whatever it is I'm doing - dyeing, drawing, collage - I set out to do at least 10 variations of it. This is because I often find that it's the 7th, 8th and 9th variations that are actually the best - the things I hadn't even thought of when I started. I like to work quickly and encourage the ideas to keep flowing from one sample or drawing to the next. And that's how I had been working during the first forty days ... and now I couldn't. By the evening of day two (note the extent of my patience!) I was on the verge of running down to the studio and cutting a pile of loose sheets of paper to work on instead of using a book. I talked myself out of it. Partly because it was late and I was tired. But mainly because I reflected that if this was how it was to be, that was going to be part of the practice and I needed to adjust to that. It would mean slowing down and being more deliberate. Taking more time to consider what was happening before moving on. The first week was painful. I was interested in bleed effects but kept using too much ink or too much water. So my marks would start out looking gorgeous and then degenerate into a splodgy mess. Oh yes, and the wet pages took ages to dry. I had to change my approach. Below are the most acceptable results from that week. In week two I was placated by some good results from combining Indian ink or Sumi ink (both water-resistant) with the fountain pen inks I favour. There were some pleasing resist effects and contrasts in texture. There was a sort of breakthrough around Day 16. I changed some of the tools I was using and tried new ways of applying the ink to the page and good things happened. I started to see some unexpected effects that I could get excited about. I also settled into a series of variations on horizontals cut by verticals, playing with different densities and line qualities. 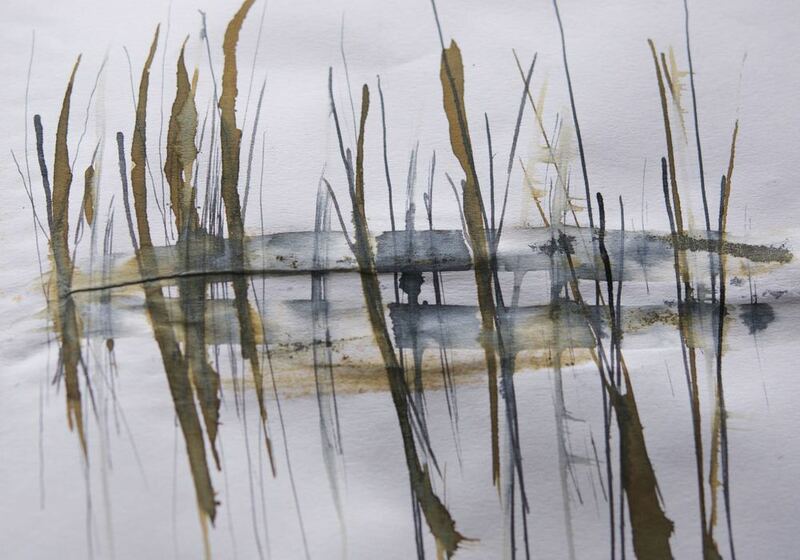 I recognise the inspiration of wetlands and reed beds and sometimes I emphasise it. The line between mark-making and drawing is a very thin one - at least in my case. I had been using pieces of scrap paper as a mask - brushing or sponging ink off the edge - and around day 25 discovered I could mono print the dried ink from these scraps onto a damp page - gorgeous! I also experimented with adding torn pieces of masking tape, which takes the ink differently. Today is Day 33. There are still "bad" pages - experiments that don't work out or where I have been careless or heavy-handed - but they don't bother me so much. Of course the whole experience has been entirely consistent with the underlying principle of my "rule of 10" - the value of pushing yourself beyond your initial idea in order to discover the thing you hadn't imagined. And the need to pay attention to what is happening and respond to it - change tools, change my approach. 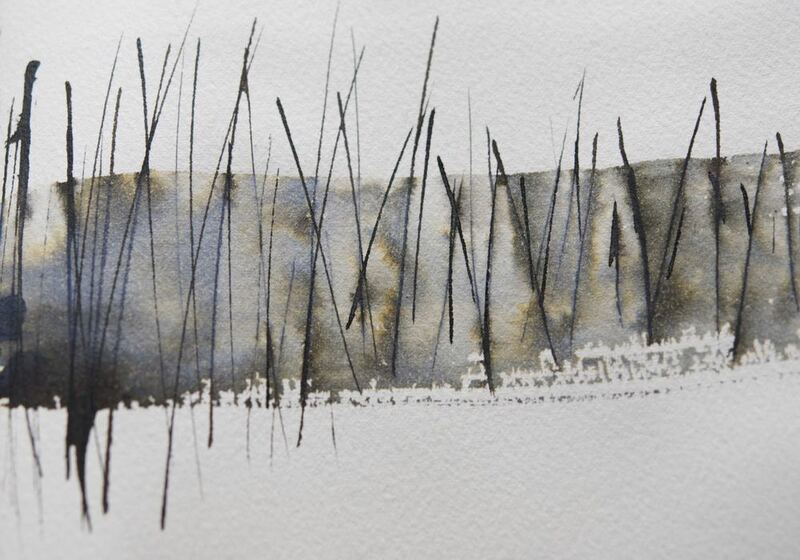 Karen Thiessen - who was one of those who inspired me to do this in the first place - wrote an update on her own mark-making practice and I was also interested in this. Often when I spend time on something that doesn't directly contribute to making work - reading, drawing, mark-making - my mind starts running on all the things I think I should be doing instead. Which pulls my attention away from what I'm doing and creates a conflict between what the experience could be and what it actually is. I think part of the value of a regular practice lies in assigning time for something and giving it your full attention. Giving yourself a chance to notice something you didn't already know. I'm not always particularly good at doing this. So, at New Year I started a daily mark-making practice. The aim being just to explore my own marks and give myself a chance to experiment. To avoid the New Year Resolution thing, I started the day I went back to work instead. And I committed to 40 days - long enough to see the impact yet short enough to feel achievable. I knew that to be sustainable it also had to be easy - so that on the worst day there would be no excuse for not maintaining it. So there was only one rule - one page a day, any mark, any medium. A single line would count. I'm using a homemade sketchbook, about 5" (13cm) square, which is filled with different types of paper (a good way to use up offcuts). I've been using whatever tools and media are on my drawing table, which at the moment is conté crayon, fountain pen ink, sumi ink, some white paint. Most days I manage more than one page - the record is twelve. On some days, I have rapidly made some marks five minutes before bedtime. It's amazing how often those aren't the least interesting pages. A happy side-effect has been handling my drawing materials every single day, which helps to get past any mental block about drawing. Indeed sometimes the mark-making has transitioned seamlessly into drawing - I've tried something out and then pushed my mark-making book to one side and used the same ideas in a more considered drawing. Somewhere around the 25 day mark I looked back through what I had done. I noticed how often I had defaulted to two or three "formulae" - the habitual marks I make when I am not working from a source. My natural handwriting in a sense. This was interesting in itself but I started to look for ways I could disrupt these patterns. Not change the marks themselves necessarily but force myself to use them differently. In my case this was partly about my use of space and varying the line quality. 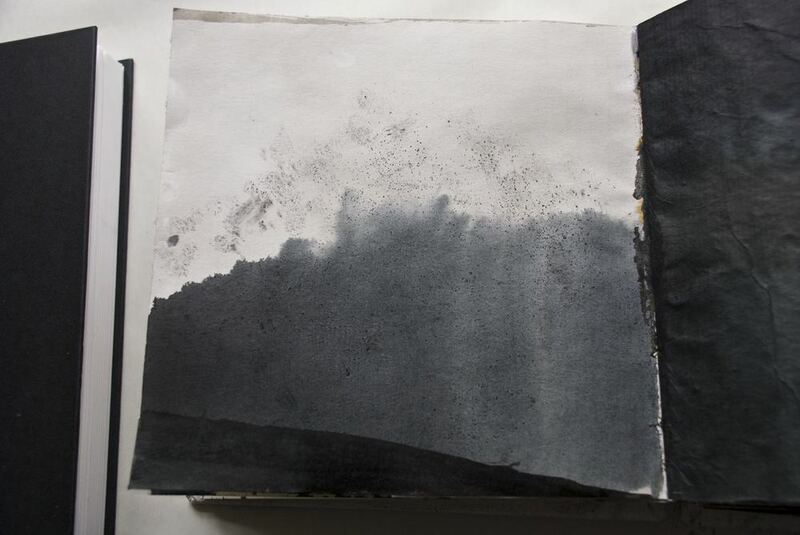 I'm experimenting with masking parts of the page, erasing, rubbing or scratching back, drawing over wet paint - looking at what effects this has on the marks and how it changes what I do. I have seven days to go. I think I will start another forty days after that - same rules, same principles, perhaps with a different technique or medium - but I think the main thing is just to keep going. I don't think I really know what I'm doing at the moment. I'm questioning lots of things about my work. And pondering several, as yet unresolved, ideas. I'm not sure - yet - where my work might go next; but it feels as though something is shifting. This is not exactly the most comfortable place to be. I know the worst thing I could do would be to stop working. That would just increase the frustration. So I figured I might as well use the time to try new things and prioritise the experiments and play - rather than force myself to make more of the same just to satisfy my need to feel I'm "Working". So while I'm in this awkward between phase, here is a round-up of what I have been doing recently. Colour mixing. This is partly preparation for another colour study. I figured that while I'm not doing anything else I might as well progress this. This puts me in research mode - logical, analytical - rather than creative, but it's all part of building the underpinning knowledge. Experimenting with folded forms. I came across a book, aimed at graphic designers, that looks at many different ways of folding printed material. So I tried out a few. I liked the different ways pages were revealed or concealed. They suggested different ways of telling a story. I was thinking about book forms. 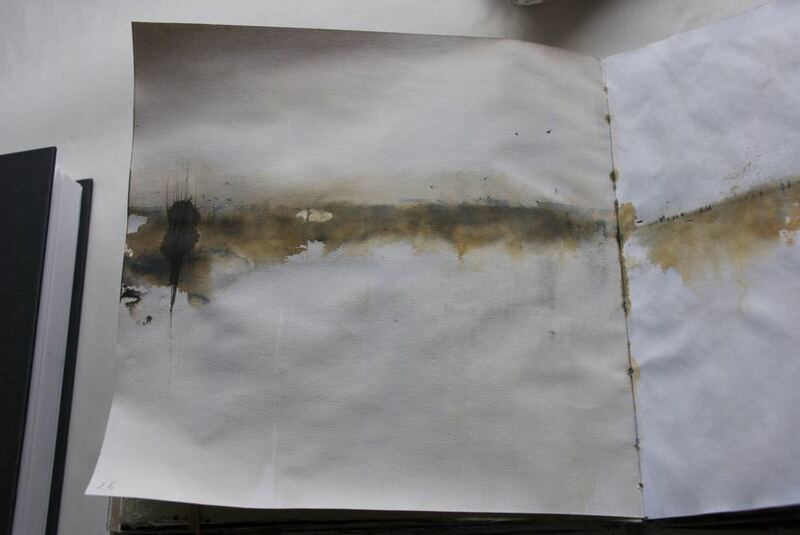 Painting pages with ink. Sometimes this is all I feel like doing. 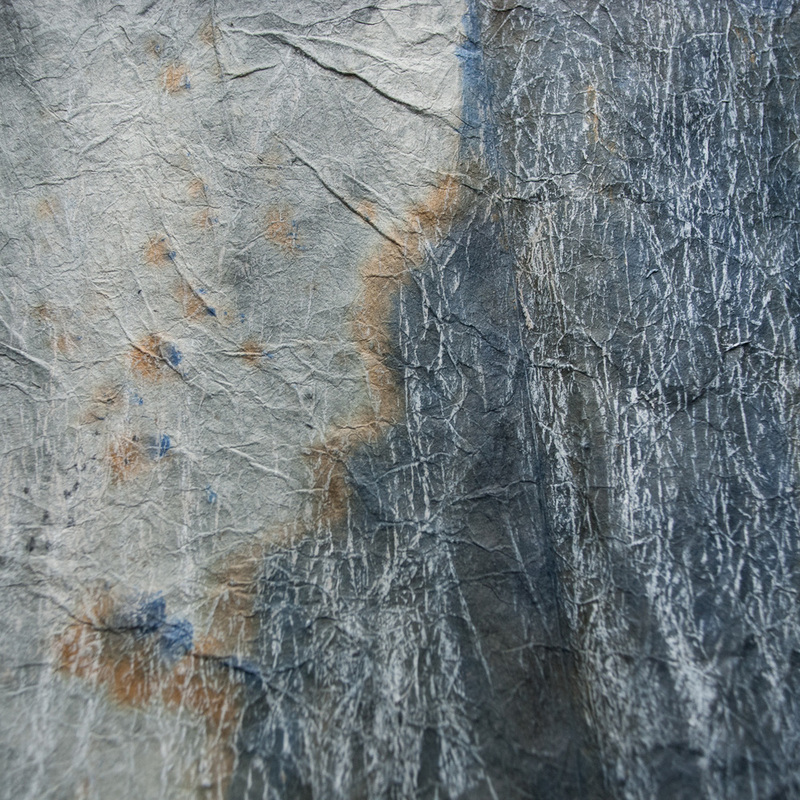 I used scraps of lining paper, newspaper, packing paper and painted them with washes of ordinary fountain pen ink. Diamine make this in lots of different colours. It behaves a lot like dye, which is probably why I like it. I enjoyed just washing one colour over another and seeing how they changed as they ran together on the paper. Turning wet pages over and laying them on top of each other meant that they stained and marked each other. I like these accidental marks. I also like the accidental marks that end up on the sheet of paper I always lay underneath to protect my work surface. Accidental drawings. Then I started playing around with the painted pages. Folding and layering different textures, colours and marks. Until I ended up with all these on my studio wall. I like the way the paper behaves compared to cloth - more structural. Inspired by my earlier paper folding experiments, I was folding and wrapping pages around each other to hold them together. Then I stepped back and looked. The middle one with the leaf print was one of the first ones I did and it bothered me. Although I like this kind of imagery in other people's work, it confirmed for me that in my own I prefer the imagery to be more ambiguous. 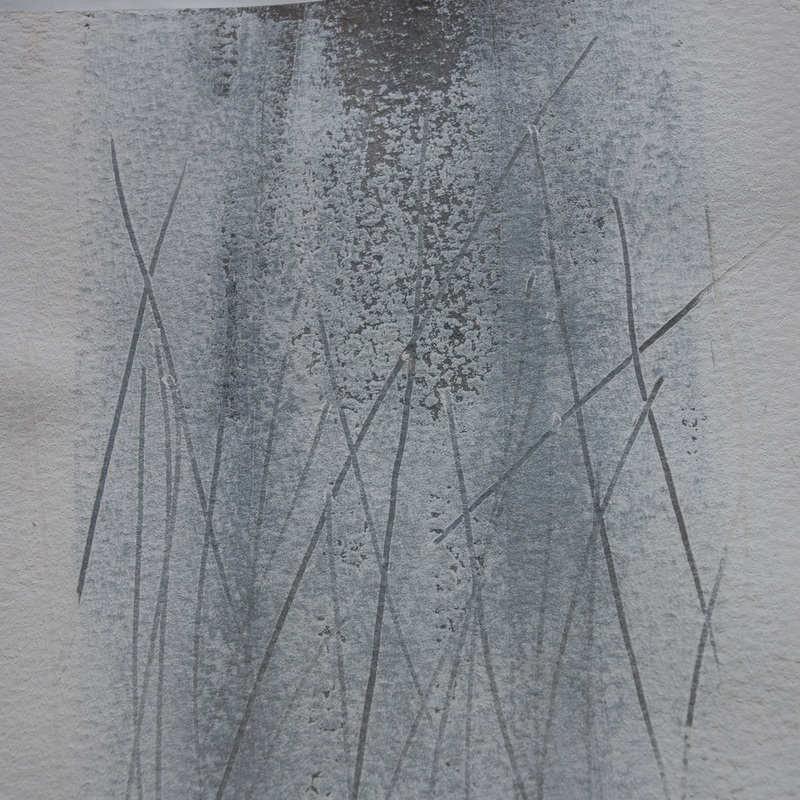 In fact, studying what I had done, I could see that it was all about lines and edges, overlapping colours and textures. I like the way many of the lines emerge from and disappear into the background. And, as with the folding experiments, I also like the sense of things being hidden and revealed between the different layers. I doubt these paper pieces are particularly light fast but I am wondering whether they could be developed into "work" in their own right. Perhaps they will influence what I do next with cloth too. Drawing. In between all this, I've started drawing my flint collection. Using different media, different scales, close up details and larger more abstract impressions. Just observing and playing around with the marks and colours. Lines, edges and marks again. I'm sure all of this will feed into my work one way or another. 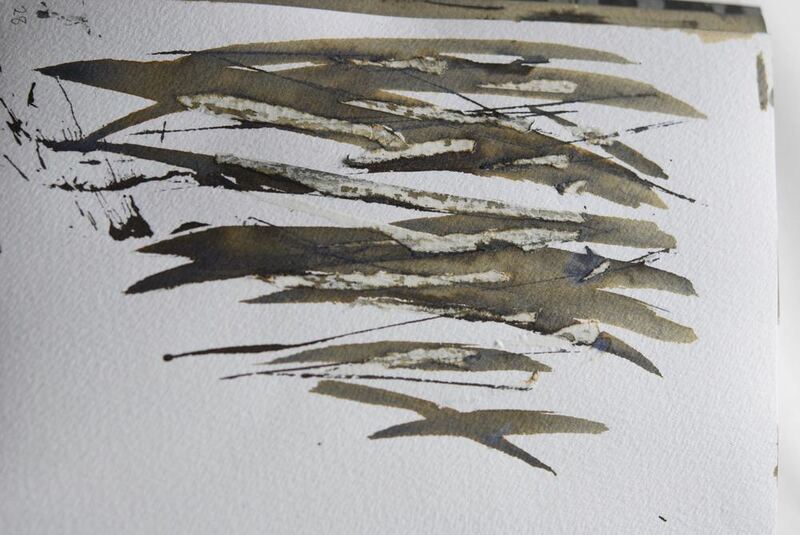 I ended up concentrating on these plant stems. I love the way, different aspects of the plant structure are revealed as they wither. I started tentatively, feeling my way through the different drawing exercises. As I relaxed, I became more comfortable but then found it hard to move away from close, observational drawing - clinging to my safety zone. But then, by day three I couldn't work fast enough - I was just trying to get each idea down before it slipped away. 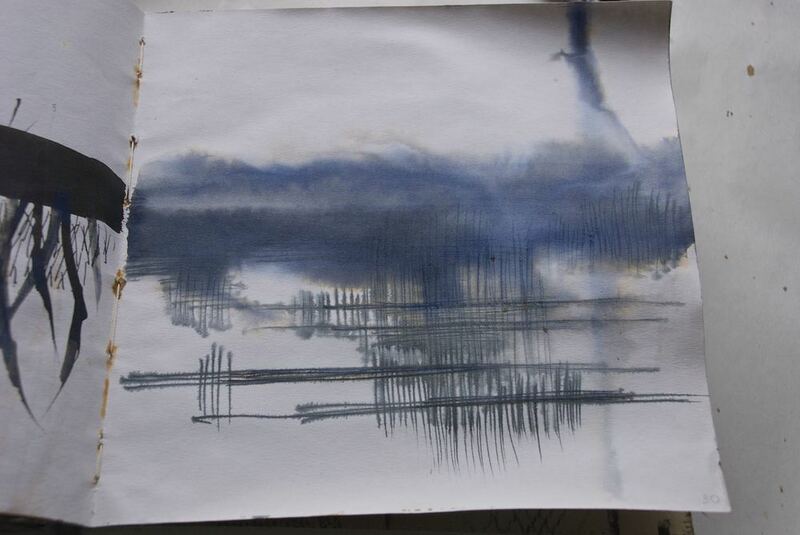 I left the source material behind as I tried different approaches to capture the elements that interested me. My table on day two. Now I'm home, I've pinned my work to the studio wall to look at and reflect. It's interesting to see the progression from the initial, slightly uncertain experiments to the faster, more confident work. I can see the links to the original objects but the drawings themselves are suggesting areas to explore and develop further. I'm not worrying about developing this into cloth - indeed I like some of these as they are. Although, there are some specific elements that I'm excited about and want to try. I've cleared a corner of my studio and am going to carry on with this for a while. Taking photographs is instinctive for me, drawing doesn't come so naturally. But I find photographs can be too passive - it's easy to end up with masses of images and ideas about them that are too vague or simplistic. I wanted to work with that last set of photographs and push my ideas further. In one of my books, the jeweller, Kayo Saito, describes her drawings as "image training". I like that idea of drawing as a thinking process. I'm not interested in copying my photos or producing an accurate landscape drawing. What I want is to bring out the elements that interest me, play around with them and see what I can do with them. 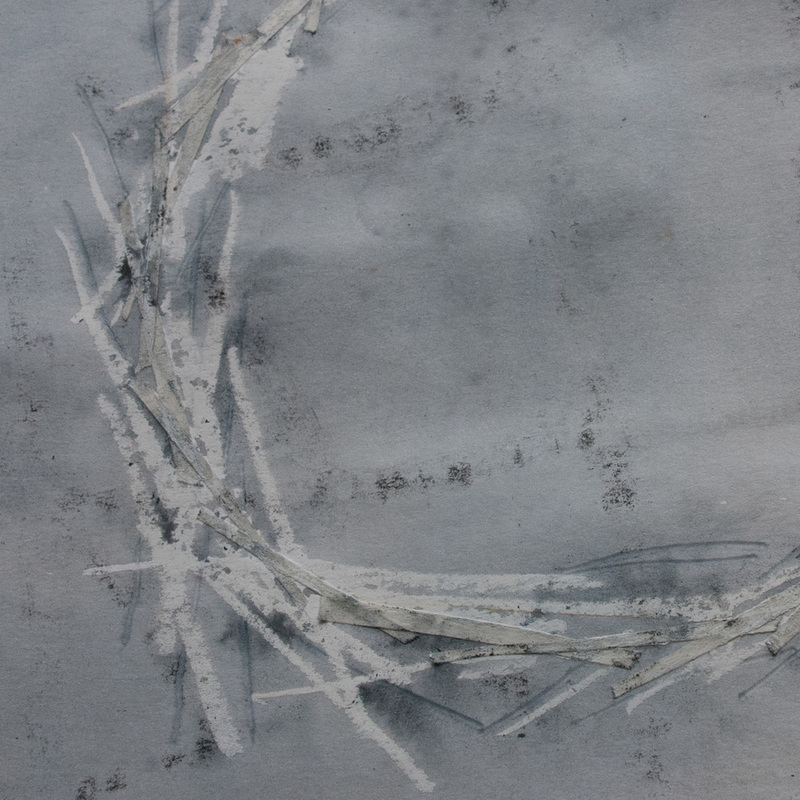 And so for the last week or so the studio has been turned over to drawing and collage. I printed out my photos and cut them up. 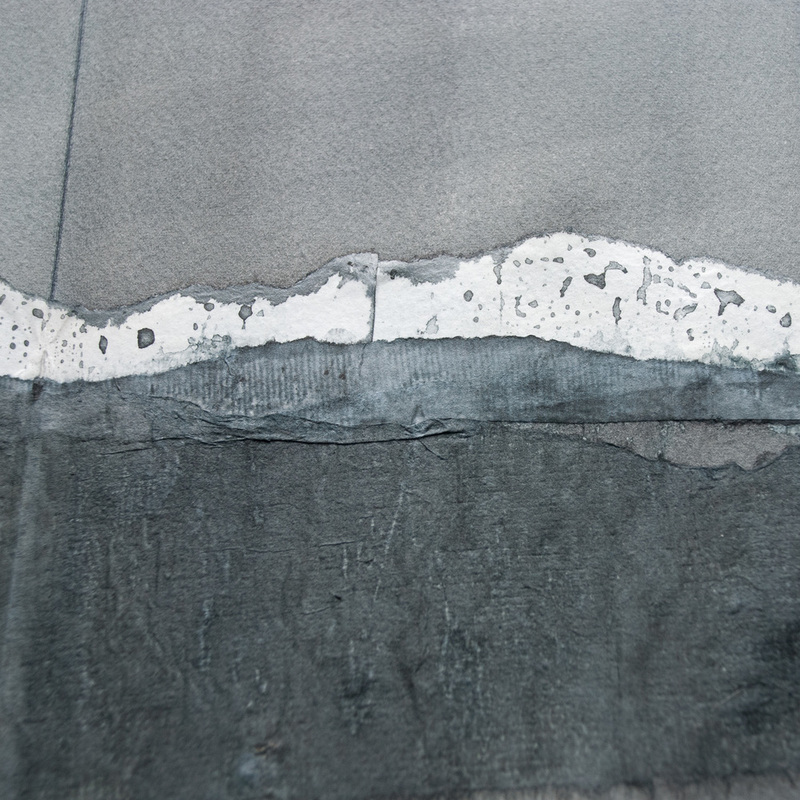 Slicing them up, taking them out of context, the linear elements that had caught my eye when I took the photographs in the first place became even more shibori-like. Arranging them into new compositions is similar to the way I would work with cloth, with lots of freedom to experiment with ways of juxtaposing the different lines and tones. For the drawing, I'm using mainly ink. Ordinary fountain pen ink - although I'm using inks from Diamine who produce writing ink in 101 colours! 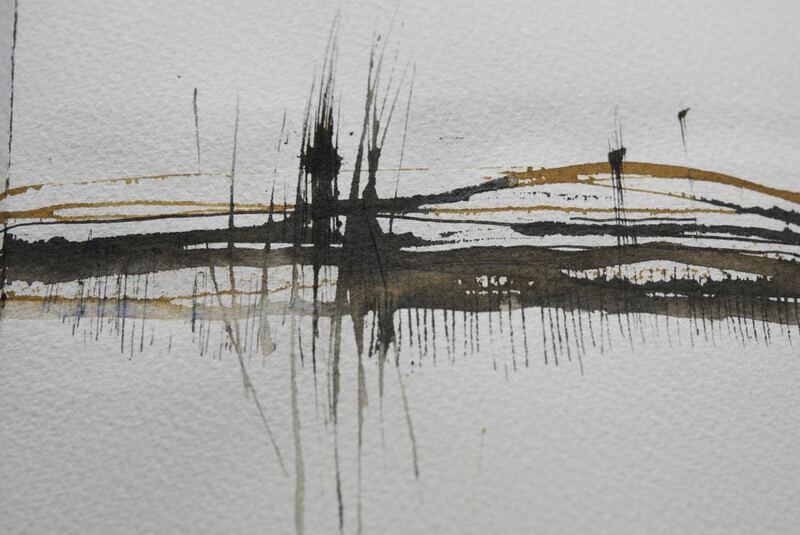 I love the way the ink flows and bleeds on the page in unpredictable ways. Plus I can dilute it to make the palest washes or bleach it. In other words it behaves a lot like dye. Hmmm. There's something here about my taste for media that I can't fully control. I think I rather like how they undermine my inner control freak and force me to let go of the outcome. 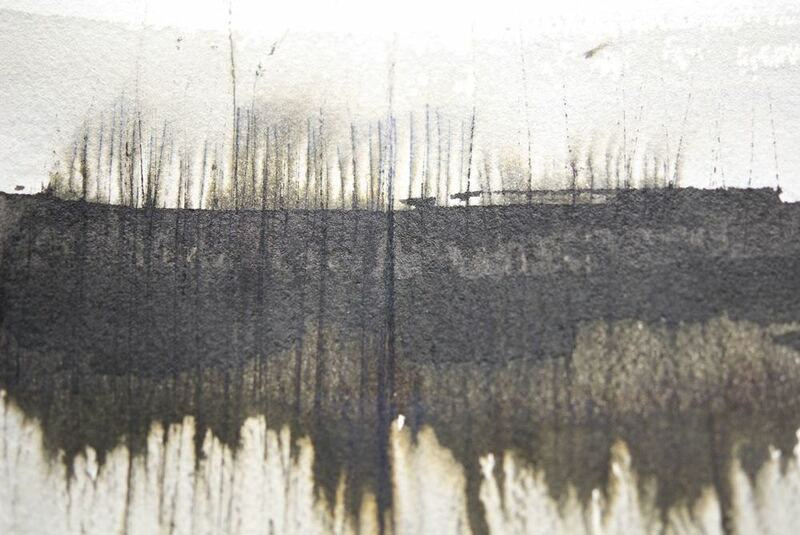 And I love the random, organic effects that ink or dye can produce. I'm not worrying about where all this is leading at the moment. There's no plan. But I'm enjoying this kind of thinking. It's generating ideas about composition, marks, colour that are moving me beyond my initial response to the photographs - which is exactly what I want.